Schirmer, 1977. Paper. Good. Octavo. 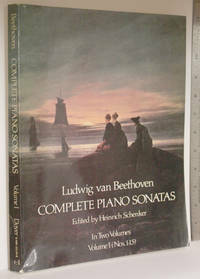 xvi, 400 pp., cover worn and discolored, else very good. 1st Paperback printing. Drei Duos (C-dur, F-dur, B-dur) fur Klarinette (in B) und Fagott; Three Duos (C major, F Major, Bb major) for Clarinet and Bassoon; Trois Duos (Sol majeur, Fa majeur, Si bemol majeur) pour Clarinette et Basson. Wien: Osterreichischer Bundesverlag, 1950. Wraps. Good. Quarto. Parts. Three duos for clarinet and bassoon. Paper becoming brittle. For reference only. Herausgegeben von Friedrich Wildgans. Plate number OBV 6781-41. Series Hausmusik OBV 6781,41. New York: Dover, 1975 xii, 284 pp. Clean and unmarked, with a large bump at bottom of spine, and progressive tilt to spine. Edited by Heinrich Schenker ; with a new introduction by Carl Schachter. 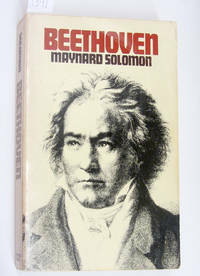 ''An unabridged and corrected republication of L. van Beethoven / Klaviersonaten / Nach den autographen und Erstdrucken rekonstruiert von Heinrich Schenker . . . published . . . by Universal-Edition A. G., Vienna and Leipzig, ca. 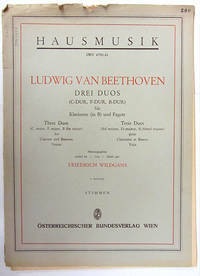 1923"--verso of the title page.. Wraps. Good. 9'' X 12''.